This recipe for Honey Cupcakes was created by White House executive pastry chef Bill Yosses. 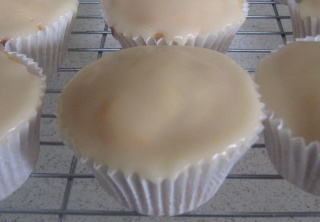 Cupcakes with buttermilk always seem to be lighter and fluffier than those with full cream milk. I don't always have buttermilk on hand so have often cheated with this recipe and the buttermilk cupcakes still work out really well. The cheat's version is to add one (1) tablespoon of vinegar to 1/2 cup milk and leave for five minutes. It will start to curdle and be perfect to add to the mixture. Preheat the oven to 350C (175F). Mix in honey, eggs, buttermilk and vanilla. Combine the flour, baking powder and salt. Mix into the batter until just blended. Scoop the batter into the cups evenly. Cupcakes are ready when a skewer inserted in the center of a honey cupcake comes out clean or the tops spring back when lightly pressed, about 20 minutes. Stir all ingredients over medium heat until sugar is dissolved.